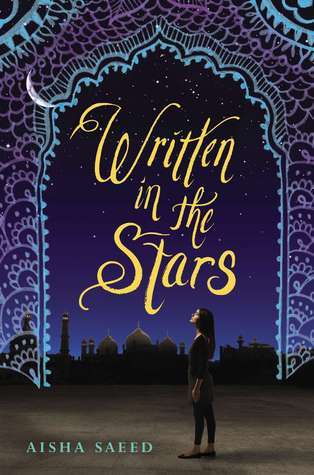 Welcome to my stop on the WRITTEN IN THE STARS blog tour hosted by Penguin Books for Young Readers. 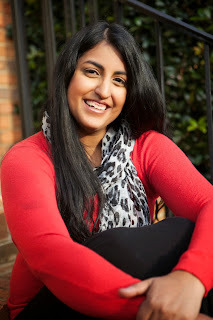 Today I have an awesome guest post from Aisha + a giveaway! The question threw me for a loop. I was prepared for Amy’s skepticism about marrying someone I knew so briefly. I had prepped my rehearsed response about how when you know it’s “the one” you just know. How some people live together for years and still end up having unsuccessful marriages. How really, you could know someone for five minutes or five years, but when it comes to how much time is enough to be sure about making that ultimate commitment it’s just hard to know, but this question? This question stumped me. “You love him, don’t you?” she asked, caution creeping into her voice. I couldn’t lie to my friend so I told her the truth. That I didn’t love him in the way she probably meant, but that I liked him a lot and that I was sure I would fall in love with time. I couldn’t blame Amy for being worried about me. Maybe in her shoes I would also be skeptical about this. Here I was, just out of college, getting ready to start my first job, and I was going to marry someone I barely knew who I admitted I did not yet love. I had to admit it was strange to an outsider looking in. But for me, growing up Pakistani-American, this arrangement was not strange at all. Much like the main character in my novel Written in the Stars, Naila, I too grew up in a Pakistani-American household and had a very close relationship with my parents. When the time came to consider marriage, my parents always told me they would accept someone I met on my own—but they also gave me the option of introducing me to someone. I had a great relationship with my parents, I trusted them, and because the concept of being introduced to a potential suitor was not foreign to me like it was to Amy, when the idea came up it didn’t feel completely out of left field for me. To be sure, I definitely did have my doubts about the process, but unlike Naila, whose parents wanted to decide her marriage for her, I had no pressure to enter into a marriage I didn’t want. I had nothing to lose when my parents told me about a great guy I should meet. I figured why not? There was no harm in seeing who they had in mind. Knowing there was no obligation in meeting him eased the pressure and one July afternoon, he, his mom and sister, and our mutual friend who introduced us all came over for lunch. We ate biryani, drank tea, and talked. After some time we were able to speak one on one and even though it was our first time meeting it felt like I was reconnecting with an old friend. It took a few more phone conversations after that before we both knew the connection felt right, and that marrying each other felt like the best idea in the world. We may not have fallen in love before we got married but I really believe love grows over time and with each passing day. I love my husband more today than on our wedding day for sure, but I also love him more today than I did yesterday. The way I got married is not going to be everyone’s cup of tea, and I certainly can understand people like my friend Amy, who can’t understand why anyone would do this, but the key is truly choice and, for me, it was not only the right decision but the best decision I ever made. While Aisha loves writing about a variety of topics, her main passion lies in channeling her inner teen. Her debut YA novel WRITTEN IN THE STARS will be released in 2015 by Penguin/Nancy Paulsen Books. She is represented by Taylor Martindale at Full Circle Literary Agency. When Aisha isn’t writing or chasing her two little boys, you can find her reading, baking, doodling henna patterns, or daydreaming about eight consecutive hours of sleep. It's so fascinating to learn about these kinds of things because they're so unfamiliar to me. I hope that Written in the Stars can give me a bigger glimpse into this culture! It's so hard for me to imagine an arranged marriage, but I can't imagine how hard it is for others to imagine anything but. What a great guest post!!! You have to go with your gut and your heart!! So beautiful! I'm glad you did what was felt right FOR YOU and no one else!!! :) <3 I wish you the best of luck!!! Your story is wonderful, Aisha! to help someone who is, please go to www.preventforcedmarriage.org. the urgency to address it.